Rise of Berlin Wall, a concrete barrier between East and West Berlin, covers 50 years, which divided Berlin and further defined the Cold War. It continuously reminds the citizens to stand up for democracy and freedom. On Saturday, observing 50th anniversary of the Berlin Wall construction, the city's mayor and people commemorated the 125 victims killed then while trying to cross the 161-kilometer wall from communist East Berlin. In 1945, after the defeat of Nazi, Germany was divided into four zones of occupation by the victorious World War II allies. West Germany housed the U.S., Britain and French, and East Germany became the territory of Soviet Union. The East Germany communist authorities ordered sealing of all crossing points between the two Berlins with barbed wire on August 13, 1961. 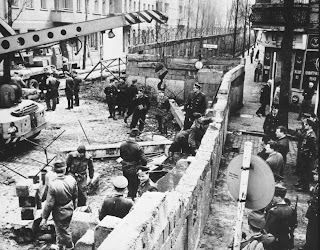 Later a wall was constructed dividing streets, neighborhoods, families and friendships. The wall had 45,000 cement blocks and watchtowers in dozens. East German border guards were ordered for shoot at sight to anyone spotted crossing the wall. U.S. President Ronald Reagan, in June 1987, challenged Mikhail Gorbachev, the then Soviet leader, in his speech in Berlin to "tear down this wall." Two years later in November residents of East Germany brought down the Berlin wall as well as the government in the communist state. On October 3, 1990 both the Germany reunited.